Everyone is rushing to convert their old photographs to a new digital format. However, without a high-performance scanner, it isn’t possible to get high-quality photos or documents. These days with advancement in technology scanners have continuously decreased in sizes while enjoying more features. One of the most popular types in offices and homes is the flatbed scanners. Before giving out your money, you need to be sure that the device will work and give expected quality output. This requires a close extermination and research. But with us you can relax. We have researched for the 10 best flatbed scanners that will achieve maximum performance. Are you wondering how to get high quality scanned color photos and documents? Don’t look further as this Epson V37 flatbed will do all that work. The device offers a high resolution of 4800×9600 dpi hence ideal even for photo enlargement. Having capability of accessing documents from the mobile devices and the internet, it cans print material directly from the Google Docs and other cloud sharing platforms. The LED light technology used when scanning reduces the power consumption and is free from mercury. The scanners are energy star certified. 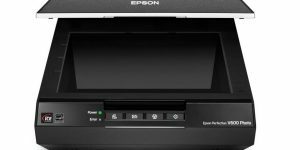 Epson Perfection V19 Color Scanner is a highly engineered device which is dedicated to producing clear photos and document. Enjoying a 4800 x 4800 dpi resolution, you can bet on its capability to produce eye-catching photos despite their age. It is an incredible machine since it is powered by connecting it to a computer via USB. It comes enhanced with scan and shares program enabling directs share on Facebook. 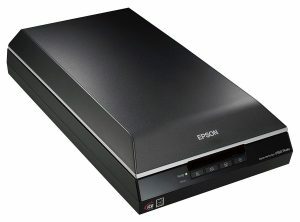 Also, Epson easy scan assists scan on Picasa and other photo applications. Operating it is easy and is compatible with the majority of current operating systems. 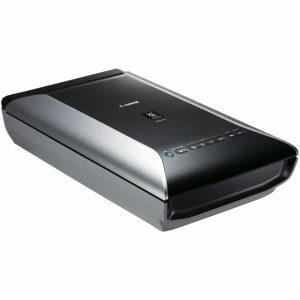 Scan your documents, photos, and negatives with ease by using this Epson V370. If you have old images and photos, you have a chance to convert them into attractive and extremely clear digital photos. It is capacitated to scan 35 mm negatives and slides and enlarge them to 13″ x 19″. 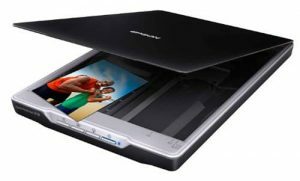 It is scan to cloud-enabled, and you can use it to scan oversized artwork, prints, and document. Whens switched on; it doesn’t require warm-up time since it has as readysacn LED technology. Buttons are simple to operate, and it has a one touch scan email or pdf. 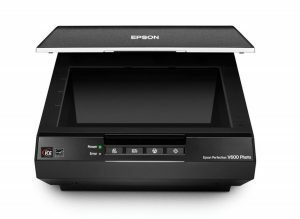 With Epson Perfection V550, scanning is as simples as might think. 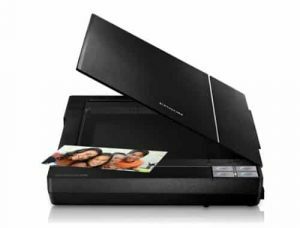 Enhanced with 6400 dpi resolution it is a perfect scanner to reproduce your old memories photographs in a digital style. Further, apart from scanning photos, it can scan negatives and slides and auto uploads them to Facebook. The digital ICE technology incorporated in this machine is ideal for making more clear photos with minimal scratches or dust. Additionally, when scanning old photos, the scanner will improve clarity to ensure their original form is attained. It is compatible with Windows and Mac OS. The Canon CanoScan scanner is easy to operate machine, with a very high resolution to deliver crystal clear photos and documents. Whenever you want to upload your pictures to the cloud network, it is easy since the device uploads them automatically. With a resolution of 4800 x 4800 dpi2, it has 48 color depths. The machine has 5 buttons which include a faster scan copy and sends to cloud. It is high-speed whereby it can deliver a document with a letter size within 5 seconds. 1-years warranty backs this scanner. 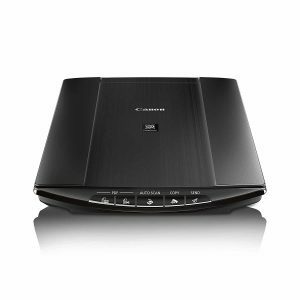 Scan everything from negative to document with shortest times possible with this scanner from Canon. It is a friendly machine which arranges photos, documents and files making them easier to retrieve through my garden software. The FARE level 3 which is an inbuilt tech, ensures the scanner automatically correct defect on old photos and documents making them easy to see. When you switch on now waiting time as machine warm up, the white LED ensures it only requires little power to start. It automatically senses what is being scanned and adjusts the scanning light.it can work with windows and mac OS. Scanning has never been enjoyable like whens using this CanoScan LiDE210. 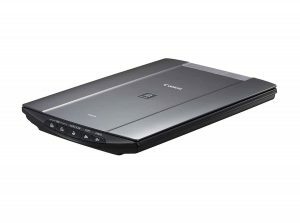 It boasts speed, ease of use and exceptional features making ideal office or home flatbed scanner. The EZ buttons are dedicated to automating the scanning process further easing the work. It is possible to scan thick materials like notebooks as it has a Z-lid configuration. With just a USB cable, it allows powering of the scanners as well as data transmission reducing the number of cables in your desk. The devices can accommodate 3-way scan positioning; landscape, portrait, and upright. The auto documents fixing enables productions of mores clears documents and photos automatically. Do you want to refresh your old memories by producing high-resolution photos? You have a perfects companion. 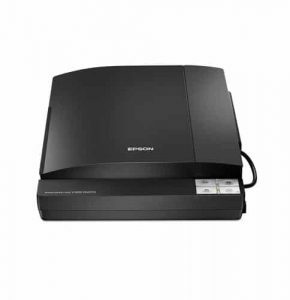 The Epson V300 is specifically designed for scanning old photos, films and 3-dimensional objects. Through its 4800dpi resolution, it can scan and enlarge photo to various sizes within a few seconds. Additionally, for old pictures, the easy photo fix ensures that are restored to their original state with mores clarity. 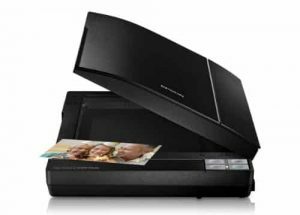 Unlike old scanners, this one is power efficient through readyscan LED technology which allows scanner to use less power. 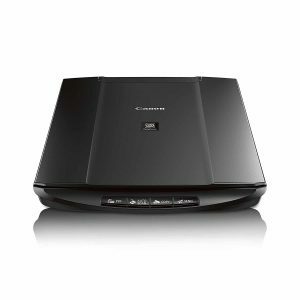 The Canon LiDE120 Color Image Scanner is all you want in your office or home to convert all your photos into digital form. You don’t need a computer to upload your photos since the scanner does it automatically to cloud by just sending send to cloud. Besides high-quality photo scanning, it is also ideal for scanning documents. The auto scan mode3 incorporated in the device detects the type of document and automatically configures itself. It is very fast in printing a picture as it only takes 16 seconds for a letter sized one. With Epson V600 you can scan everything and be able to see it clearly. This corded scanner boasts heavy-duty construction with high resolution 6400 x 9600 dpi to give exceptional clarity. Unlike other scanners on the market, this one can enlarge a picture up to 17’’ x 22’’. It can scan slides and negative regardless their age and still deliver clear digital images. Additionally, it is useful in eliminating the tear in new photos while restoring old and faded ones. Equipped with LED lighting mechanism, this ensures no warm ups time and less power consumption. It is energy stars approved. Flatbed scanners are the most ideal for small offices, and they occupy little space. On the other hand, they make great devices for home uses for people who love photography. They assist in recalling your old memories by giving your photos a new appearance. Don’t throw away your old films and negatives, get a flatbed scanner and experience the fun.